with 2 colors available: Silver or Black, black color by default. 4.3-inch TFTtouch screen of LCD,Built-in AM/FM tuner,Support SD card function with USB slot,RDS function,TV-tuner,Bluetooth. - RDS (for European countries). - Multi-function IR remote control and instruction manual included. 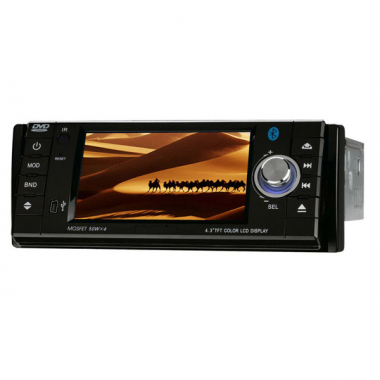 - Video and audio output, and rear monitor video. - Digital audio output, and 50Wx4 max power output. - TV-tuner with PAL/NTSC/SECAM:D/K.I.B/G.M video system.